The rumors were (mostly) true: Intel has unveiled its first 9th-generation Core processors, aiming them at desktop-based enthusiasts. The updated CPUs ultimately represent a refinement of Intel's existing 14-nanometer chips, but promise both more headroom for overclocking (thanks to new soldering), support for Optane-based memory sticks and hardware-level mitigations for Spectre and Meltdown attacks. 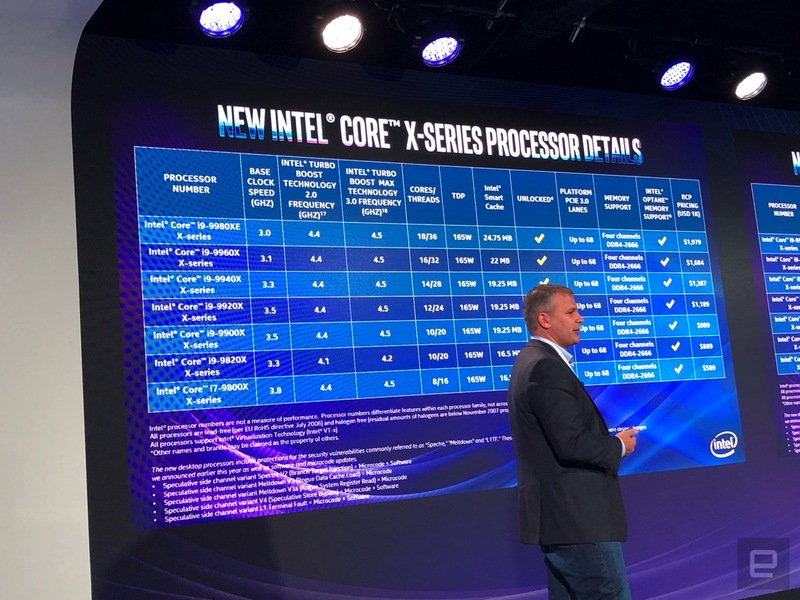 Naturally, they also boast lots of cores -- not as many as that 28-core Xeon, but you can now expect at least eight cores and the same 18 cores as last year in the flagship Core i9-9980XE model. 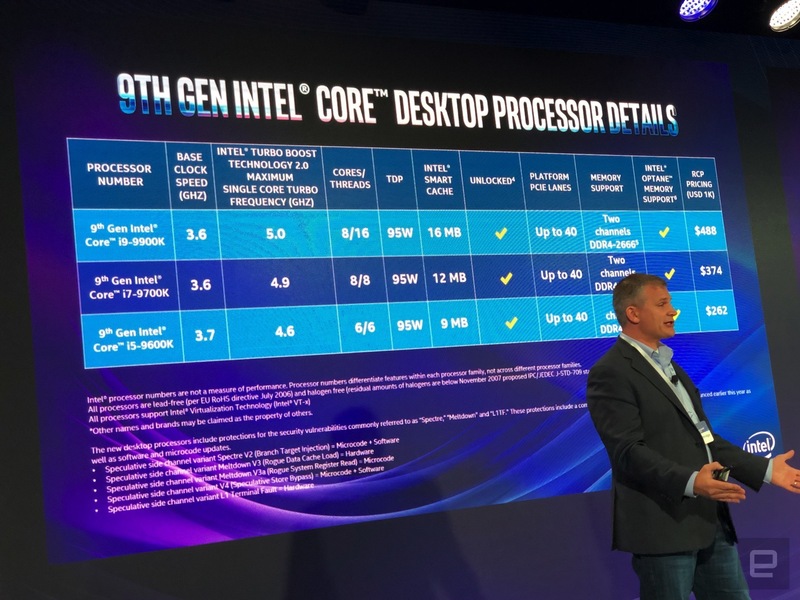 The Core i9-9900K, meanwhile, is billed as the first "broad volume" processor to hit 5GHz, albeit 'just' when using one of its eight cores (it normally starts at 3.6GHz). You can also expect subtler improvements in the X-series, such as quad DDR4 memory channels and as many as 68 PCI Express lanes, the latter of which should help with multiple video cards and solid state drives. The regular enthusiast chips still offer dual-channel DDR4 and up to 40 PCIe lanes. You'll also see common tweaks like unified cache across cores and AVX 2 instructions that can handle multiple forms of data with a single command. You can pre-order the new processors today ahead of an October 19th release. The mainstream chips will sell at retail for prices between $262 for a 3.7GHz Core i5-9600K and $488 for the i7-9900, while the X-series starts at $589 for an 8-core 3.8GHz i7-9800X and soars to $1,979 if you demand the 18-core, 3GHz i9-9980XE. One thing's for sure: Intel is gunning directly at AMD's second-gen Ryzen line with its first 9th-gen parts. AMD has had the advantage in core count on regular processors for a while (if not necessarily raw performance), and Intel can now match it on at least a basic level.